Taking another short break from the moving stuff (which is really becoming a bit of a redundant refrain I'm sure but no one will be happier to stop saying it/hearing it than I!) to do a quick blog post and send a big thank you and virtual hug to Lois for her friendship, thoughtfulness, and excellent taste in baked goods! When I went up to the old place the other day to pile more of the 9-years worth of accumulated stuff into the car, there was a Priority Mail box waiting on the front porch that apparently the mailman had just dropped off. Looking at the familiar return address from Boston, I wondered what it could possibly be that Mags had sent me? I had ordered chocolate chip cookies from her Fleur de Lis Etsy shop earlier but those had already arrived and been eaten (and they were delicious I might add!) so I knew that couldn't be it which left me without a clue. I didn't want to open the box while in the middle of the morning's moving activities so I decided that the mystery could wait and added the box to the stuff in the car with plans to open it once I got back over to the new apartment. Imagine my surprise and delight when I finally opened the box to find a delicious cake and a note inside saying "To Linda and Amanda - Welcome to your new home - A gift from Lois". Of course I had to take a picture before cutting into the cake - much to Amanda's chagrin though you would think she would be used to the whole picture-taking before eating blog-related stuff. Obviously I have been away from the Blogosphere too long if the kid can't remember the simpler rules of Blog Etiquette! Now, nothing for nothing but I am apparently a complete and total dope when it comes to anything of an alcoholic nature as even though the cake was completely and totally delicious, it didn't even dawn on me that it was a rum cake until Amanda got her piece and said "this tastes like rum". Huh? "You're 16 - how do you know what rum tastes like?" "I tried some when I was in Puerto Rico at Christmas and we were visiting the Bacardi factory. Besides, can't you tell just from the smell?" Er ... no ... Of course, once she pointed it out, I was then able to tell that there was definitely some rum in the cake but I was more impressed with the pecans and the moistness of the cake and Lois' thoughtfulness in ordering it for us. I've never had a "Welcome to Your New Home" cake before but I think it's something I could definitely get used to! Not that I'm planning on moving again anytime soon once I get through the pain-in-the-everything that this move has been, though, even if there were another cake involved! I really wish I could have all of you over for a slice and a cup of coffee (and to put you to work with some of the remaining stuff I have to do!) but alas, the cake is almost gone already and I've got to schlep over to the old house to load up the car yet again before heading into work this afternoon so I won't be here to put the coffee on. Darn! You'll be happy to know that I am making progress, though, and that the piles of boxes from the other day's pictures are not as high or intimidating or out of control. I'm getting there - slowly! Hopefully things will return to what passes for normal soon and I'll be as green with happiness as Evra - or something like that! 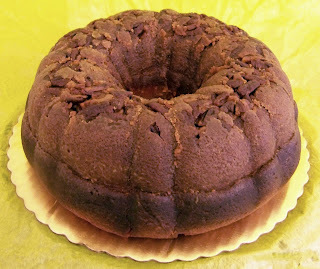 ... Hmm, speaking of happiness, I think I'll grab a piece of cake before heading out the door ... thank you again, Lois! OH MY!!! I've been refraining from ordering one of those rum cakes because I'm trying to stay away from sweets. It looks SOOOOOOo good. I LOVE rum cake. What a thoughtful gal that Lois is! man does that cake look good,minus the rum of course in my case. I'm glad you liked the cake. Good for Lois! Looking at the post below, you have a bit of settling in to do, but are managing. Lois is indeed a sweetie pie. What a thoughtful thing for her to do. The cake sounds wonderful. I think i am goig to move just so she can send me a cake. yummy. she is so kind. Queen took the words right out of my mouth. What do I have to do to get one of those cakes? Mooovee?? From now on anytime anyone goes anywhere, we should all buy something from Mags .... The eaters will be blissfully happy and Mags will be rich. hum, that's new to me. I've heard of rum balls and rum punch...and of course rum and coke....but never a rum cake. Did you let her eat it?? I'm so glad you liked it. welcome to your new home! What a thoughtful gesture on Lois' part. I am wishing I woulda thunk up that one!! That cake looks yummy. Lois is a gem, isn't she? :o) Well, welcome to your new home, girls! CAKE! That was a very thoughtful housewarming gift. Cake would take some of the sting out of moving! Lois needs a special badge for that. What a sweet thing to do and what a wonderful moving gift. Rum cake is delicious too. It looks like you're making progress in the photos below. Use the cake as a reward for your moving work.